Saturday, September 26th will mark the return of alt-country singer/songwriter Andy Friedman to The Brass Rail. Described by The Athens News as “the hillbilly Leonard Cohen,” a little digging shows that he’s much, much more than that. Depending on what trips your trigger, you may have heard of Friedman from either is music, or for his illustrations and artwork. A native of Brooklyn, Friedman graduated with a BFA in painting from the Rhode Island School of Design (the same university that spawned such acts as Arab on Radar and, more notably, Talking Heads). While working in the mailroom of The New Yorker, he started submitting his own work under the pseudonym Larry Hat, and eventually found himself a career as a freelance illustrator, selling works to both The New Yorker and The New York Times Magazine, as well as other notable publications. In 2002, Friedman left The New Yorker, began performing spoken word poetry while projecting his artwork as a slide show, and doing album artwork for other musicians. 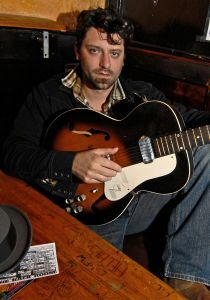 Friedman released his first album, Live at the Bowery Poetry Club for City Salvage Records in 2006, but didn’t begin playing guitar and singing until the aforementioned “Taken Man” in 2007. He then followed up with Weary Things in January of this year. According to Friedman, the transition from visual to musical artist was a natural progression, and not entirely planned. “This life, meaning the life of the touring songwriter and musician, influenced the old slideshow. When I started doing that show in 2002 I was strictly a visual artist. Never sang a note or played guitar in my life. I put out a book of my pencil drawings and poems called Drawings & Other Failures and envisioned this as offering the closest thing I could to what a songwriter offers as an “album.” To me, it was a collection of music and lyrics that you look at, all unified and housed as a cohesive whole. The way I thought about it, if I had an album I had to have a live show, and hanging my work on the wall wasn’t going to cut it, so I traveled around with a slide projector and a small screen accompanying projections with spoken lyrics and stories in the same kind of rock clubs and bars I now play with the band. Somehow it worked, and after two years I introduced musical accompaniment to the process. It all sounded a bit like Hank Williams as “Luke the Drifter,” but with visuals. It wasn’t long before I learned a few chords and started strumming along with the band, singing the spoken stuff, and ditching the visual element to emerge as a bandleader, all quite by accident,” according to an interview he did with The Brooklyn Rail this past May. Just like many other musicians, Friedman cites his influences as being partly from the usual suspects for his style of music (Dylan, Springsteen, Joni Mitchell) as well as a few unexpected ones (Randy Newman, Frank Sinatra). Having listened to his music, I can tell you that the Leonard Cohen comparison is a pretty accurate one. His low, slow style of singing is quite reminiscent of Cohen, but also bares some resemblance to more modern artists such as M. Ward and Damien Jurado. Just like anyone influenced by the likes of Bob Dylan and Leonard Cohen, where Friedman shines is in his lyrics. With lines like “I miss being broken,” and “I understand what Van Gogh understood / I can see why he took off his ear,” one gets the picture of a man who isn’t afraid to wear his heart on his sleeve. Andy Friedman and The Other Failures will be playing The Brass Rail with local openers Lee Miles and The Illegitimate Sons on Saturday, Sept. 26th at 10:00 pm. This show is 21+ and cover is TBA. It should be a great night of art/alt country/folk with a true renaissance man, combined with one of Fort Wayne’s best bands. Bring your hanky, your drinking cap, and your dancing shoes. And once again, if you are in a band, or know of a band that you would like me to cover, please email me at ben.larson.musicscene@gmail.com. 20 people	reviwed this story with an average rating of 1.9.